The following information will not only help you in troubleshooting your spa, but will also guide you step by step in repairing it. All the information below is for mechanical control boxes however some of it can be used to troubleshoot a control box with a printed circuit board, use what is applicable. 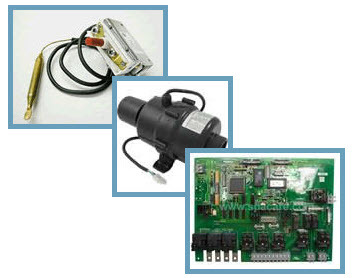 If you have a Printed Circuit Board in your control box click here for more information. 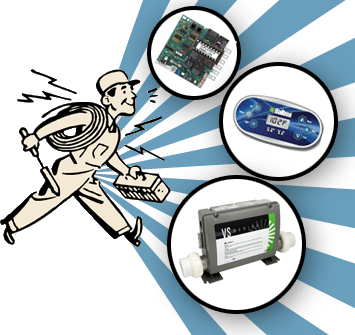 Important Note: To troubleshoot your spa, you will not only need basic tools, but will also need a multi-meter that can check for Voltage and Resistance (Ohms). It would be impossible to troubleshoot your spa without one. Make sure the batteries are fresh in the meter to insure you get accurate readings. GFCI trips when powering up the system or when calling for heat. The water gets too hot. Water leaks from around the shaft of the pump motor. I can't seem to find the leak in my spa. DISCLAIMER:We at the Spa Care Center use the same troubleshooting techniques that have been provided to you and are fully confident that they work. But, when dealing with water and electricity, it always provides a danger that must be respected. Therefore, we will not be responsible for any bodily injury that may occur when repairing your spa. Please be very careful!